Enjoy the beach - walk to Mission Bay Beach and enjoy the San Diego sun and sand. The sound and smell of the bay are at your front door. Enjoy the fireworks of Sea World every night from the beach at Mission Bay - we also have beach chairs, umbrella and beach towels for you. We are one of the few vacation rentals in Pacific Beach with Central Air Conditioning - San Diego has experienced hotter than normal summers and falls. Three bedrooms, two baths will comfortable sleep up to ten. You will have views of Mission Bay and the lights of San Diego. The Mission Bay boardwalk will take you to the Pacific Ocean. Everything included - 48' LCD TV, WiFi, DVD player, balcony, a fully equipped kitchen. The master bedroom has a king size bed, second bedroom has a queen size bed, and the third bedroom has a bunk bed and a trundle bed. The third bedroom will sleep 4 children. The couch will make into a bed also. Two car garage with ample guest and street parking. We love to vacation in our condo. San Diego is a special place - with the world famous San Diego Zoo, Sea World, wild animal park, bay and ocean. The air conditioning is a real plus on high humidity days. 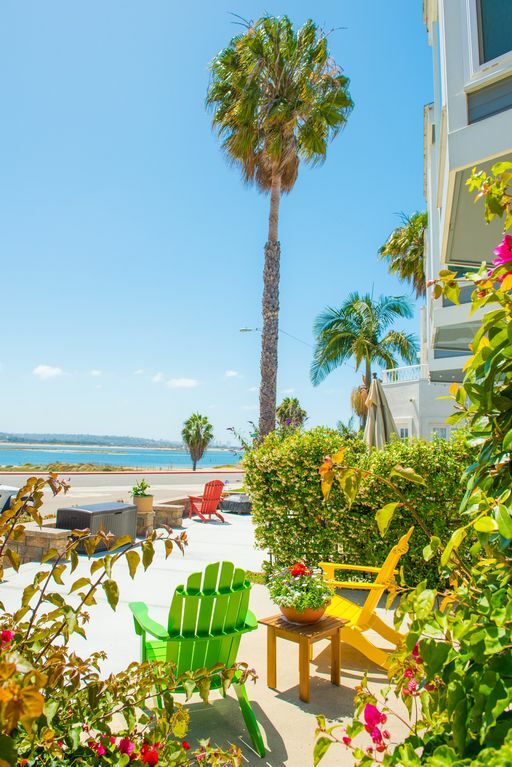 We use our condo numerous times during the year and want to have all of our guest feel as comfortable and welcome as we feel when in San Diego. The air conditioning has made a real difference in our comfort. Most of the time it is not necessary but when it is - WE HAVE IT. It is a easy walk to the beach across the street. 20 Minutes from downtown San Diego and the Gas Light District. We provide several bikes to ride to the ocean. It is an fun ride along the strand. Across the street from Mission Bay. Walk to the beach and enjoy a day without having to worry about parking. Watch the video and see the action on Fiesta Bay. We have central air conditioning - we are one of the few units in Pacific Beach with central air conditioning. The living room has a ceiling fans. Central Heating - ceiling fan in living room with fans provided for each bed room. Front load washer in garage. Two car attached garage but street parking is also available. Two car attached garage. Fits two small cars (tight squeeze) or one midsize car or van. Full size trucks and Suburban type vehicles will not fit. Entry is from alley making two cars difficult. Bathrooms have towels, wash clothes and hand towels. In addition, beach towels are available in hall closet. Extra refrigerator in garage for water and beverages. We have BBQ tongs, place mats, and crock pot. Fully equipped kitchen with all stainless steel appliance, new cabinets, granite counters with utensils -microwave oven, toaster and blender. Gas range. Table has several leaves and can seat up to 10. (2) 42 Inch LCD with HD in living room - 36 Inch LCD HD in Master Bedroom. Balcony off of master bedroom. Great place to drink your morning coffee or evening wine. La Jolla cove is a superb place to kayak. A must do. Rental bikes are also available. Three adult beach cruiser and one smaller child bike. Bikes are also easily available from one of the many bike rental stores in town. Off Street Parking: In addition to the two car attached garage - guest parking. WiFi (Wireless Internet): Secure WiFi - password protected-all included in chateau manual. Along with a directory of local restaurants, shopping, sight seeing, hiking venues we have come to enjoy. This Condo is an absolutely incredible spot. Perfect location, beautiful and spacious with everything you could need! Parking was especially helpful. The area is quiet but plenty of stuff nearby, and you can't beat morning runs along the water right out the front door! Nice location, beautiful view lots of room! We love looking at the bay. In the morning the crew boats, afternoon the recreational boaters and at night the reflection of the lights. It is really special. Very nice, updated and modern condo. It was very clean, organized and comfortable. Simple things like having extra towels and linens were very convenient. Had everything we needed and was a very convenient location for Sea World, the Zoo and Downtown. There are also a few restaurants and a nice park a short walk away. We wish the weather was better during our stay so we could have utilized all the beach gear that was provided! A note of caution if traveling with very young children/babies (or elderly folks), the stairs are quite steep and we had to barricade at the top with a baby gate to prevent the toddler from any accidents. We did have to bring our own pack-n-play and high chair, which was a slight inconvenience. We did really enjoy our stay here and would not hesitate to book this place again! We really appreciate the positive comments. Our condo living space is located on the second level of our complex. We want to make sure everyone is aware of this and we do have baby gates. Great place to stay in San Diego! This comdo was really nice! It exceeded our expectations. It was so nice to be able to come "home" after a day of activities and have everything we needed. The rooms were great and the entire house was just as it was pictured online. I would definatley stay at this condo again. Frank , the owner was extremly helpful with the rental process. Thank you. We are constantly updating our condo. We want every guest to feel at home and make their vacation rental superb. I work personally with our guest and am usually available. If not we have a property management company that is local to handle last minute needs. It was very comfortable & enjoyed very much. Thank you. We provide a variety of daily living necessities. We work hard at making all guest stay comfortable. The unit was in excellent condition and extremely well-equipped with more kitchen items than any previous rental we've encountered. The kids loved having sand toys and boogie boards to use in the ocean, and we appreciated having plenty of chairs for the beach. We did not use the bikes that were available. We used all the beds in the unit and even the pull-out couch mattress was comfortable, which is quite unusual. The balcony is off the master bedroom and quite small, with a table that can accommodate only four chairs, so we did not use that space. The picture for the rental showing Mission Bay and some Adirondack chairs, was not for the unit we were in, but we weren't far from one of Mission Bay beaches so we just walked there. The kids enjoyed the beach on Mission Bay and the playground there. We had a two year old in our party and we had to place baby gates and a bench along the railings of this second story unit because her head and body fit through the railings, so be aware if you have very young children. It's doable, but does require safety measures and some vigilance. The air conditioning was wonderful during the record heat that was blanketing the area. The noise from outside is almost non-existent. One nearby house was having a late party which we could hear, but otherwise, it was very quiet at night. We were pleased to have a garage for one of the cars, which made access to the house so easy. Street parking was available for the other vehicle and we did not have a problem finding spaces. The rental manager, Dixie, was very helpful in advance of our trip and while we were there. We rented a crib from Toddler's Travel and a car seat, which made travel much easier. The owner, Frank, was very prompt when asked a question about the property. We highly recommend this location and beautiful property. Thank you. We are always striving to make each vacation in San Diego a great one. The air condioning has made our condo a great retreat from the hotter than usual weather. See Sea World, San Diego Zoo, Wild Animal Park, Board Walk, Gaslight District and the beach (you can walk across the street). You will also be able to visit La Jolla, Little Italy, Old Town, San Diego Harbor, Mexico, and Sea Port Village. Golf, bicycling the strand, surfboarding, and skate rentals are available at Belmont Park. 'The Coaster' and 'The Plunge' roller coasters are also available along with an indoor swimming pool at Belmont Park. Mission Bay Beach around 100 Steps! DOD and Military personnel offered discounts. Pet Fee of $65 for first pet; $50 for second Holiday periods have slightly higher rates. Holiday periods are Easter, Memorial Day, Fourth of July, Labor Day, Thanksgiving, Christmas and New Years. Weekly rates are the norm but daily and weekly rates are shown for periods greater than 7 days.